David Eagleman (@davideagleman) is a neuroscientist at Stanford, host of Emmy-nominated PBS/BBC series The Brain, author and co-author of several books including The Runaway Species: How Human Creativity Remakes the World, and CSO of NeoSensory, a company that specializes in sensory substitution technology. The science that encourages lifelong learning as a way to fend off the effects of neurodegenerative diseases like Alzheimer’s. How the human brain processes senses beyond sight, sound, taste, smell, and touch — and how we might upgrade our senses in the not-too-distant future. What flipping a coin can tell us about the subconscious brain. How our memories and self-identities are built from the brain’s interpretation of reality — which is quite different from reality itself. Will we ever be able to download skills directly into our brains? Your brain is a large part of what makes you you. It governs the senses through which you perceive the world, and provides the means for the world to perceive you uniquely. If you damage your hand, it’s inconvenient. If you damage your brain — even a little — the person you are may no longer be the person you were. Stanford neuroscientist, author, documentary host, and CSO of sensory substitution technology company NeoSensory David Eagleman joins us to shed some light on the neuroprotective benefits of lifelong learning, why seeing (or hearing or touching or smelling or tasting) shouldn’t be believing, and the not-too-distant future of sensory superpowers. Listen, learn, and enjoy! Learn over 500 subjects (no tests or homework!) at The Great Courses Plus — including The Art of Negotiating the Best Deal. Listeners to this podcast get one month free at thegreatcoursesplus.com/jordan! If you stop to evaluate the room where you find yourself right now, you rely on the senses at your disposal to paint a picture of the overall scene. Provided you possess the traditional five senses, your eyes are viewing these words. Your fingers are probably resting on a keyboard or are wrapped around a smartphone. Your ears may be listening to anything from a favorite Spotify playlist to children playing outside. Perhaps the taste of morning coffee lingers on your tongue while your nose is trying to guess what kind of fish some rude coworker just started warming up in the office microwave. There’s a lot going on. But is your brain piecing together the details of this information in a way that paints an accurate picture? What we’re aware of is the brain’s interpretation of the world around us in a way that makes sense on a surface level rather than the overwhelming entirety of minutiae that we’re processing moment to moment on a subconscious level. In other words, we’re operating on a need-to-know basis, and — compared to the raw percentage of incoming information on which our brains are constantly chewing — we don’t really need to know much to navigate our way around our place in the cosmos. Our senses are far from perfect, and the information they gather doesn’t always get processed by the brain in a reliable way. For instance, an eyewitness in court might swear she saw two males of average height accosting a newspaper vendor in broad daylight when maybe it was really just one husky-voiced woman yelling at a couple of guys running a hot dog stand under a bright streetlamp at dusk. It wouldn’t be perjury because the eyewitness believes her account represents the truth, though the intervening month between then and now has made fiction clearer than fact. The data gathered by the eyes only constitutes about five percent of what’s really going on, and the brain fills in the rest based on what it’s expecting from the environment. “Really what your eyes are for is just taking care of violations of expectation,” says David. This holds true for most of our senses — the way we take in external data is minimal compared to the heavy lifting our brains do to process that data. 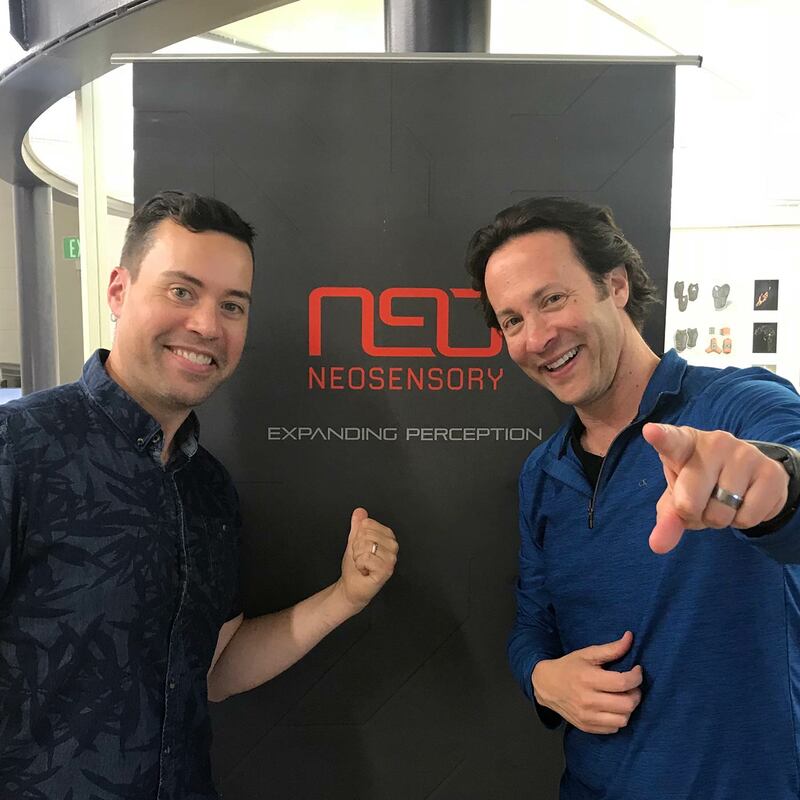 Bu the upside of this is that neuroscientists like David and his team at NeoSensory have been creating technology that allows senses to pick up data traditionally gathered by other senses. This is what allows a blind mountaineer to climb by “seeing” with his tongue, or a deaf person to “hear” music with her skin. It could also pave the way for the invention of entirely new senses yet undreamed of. Imagine tasting colors, hearing food, or touching brightness. The human brain is far more adaptive to changes — from learning new things to rewiring itself after severe damage or surgery — at an early age than later in life. But just because most of us listening to this podcast are past our prime for optimal learning doesn’t mean we should give up on learning new things throughout our lives. Beyond keeping life interesting, staying mentally engaged has been proven to keep the ravages of neurodegenerative diseases like Alzheimer’s at bay. Cultivating an active social life is one of the best ways to maintain this level of cognitive fitness, but David points out that playing an instrument, learning a new language, juggling, or really anything that motivates us enough to get out of bed in the morning can work wonders. “The key is, once you start getting good at something, you do the next thing that’s hard for you,” says David. Listen to this episode in its entirety to learn more about why our brains exhibit more plasticity when we’re younger and what purpose rigidity serves as we age, what studying nuns for 30 years has taught us about cognitive preservation even in the presence of physical neurodegeneration, how anosognosia knocked a justice off the Supreme Court, what VR adoption might do to make lucid dreaming more common to our species, and lots more. Click here to thank David Eagleman at Twitter!